How Great Can Marriage and Life Be? Many books focus on the differences between men and women. Dynamic Synergy focuses on how they can grow and work together as a team - to accomplish great things. Fiercely loyal to each other and their missions, the eight exemplary couples profiled provide outstanding examples of teamwork. Whether you're married or not, what these husband and wife teams accomplished, and how they did it, will inspire you. Despite different personalities, their loving ways reveal the ingredients necessary for a tremendous marriage and life. They preserved in creating and maintaining a productive relationship, while contributing their individuality to the team's success. 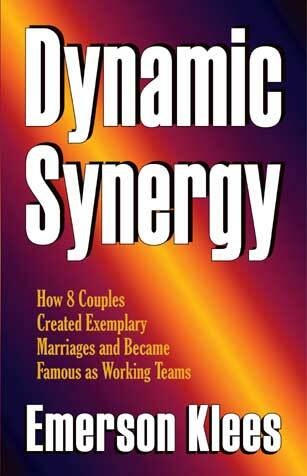 This is how successful couples create dynamic synergy--- causing their combined output to be far greater than it otherwise would have been had they worked separately! Communicated more clearly, openly, and effectively---with love. Nurtured interests that enhanced the team's dreams, goals, and objectives. Focused on working together superbly---personally and professionally. Benefited from each other's strengths, while complementing weaknesses. Offered and accepted encouragement and constructive suggestions. These eight sterling role models demonstrate that no one set of abilities, personalities, backgrounds, circumstances, or particular field of endeavor is required for the success of a husband and wife team. It all depends on their empathy for and understanding of one another, as well as their commitment and resolve, but most of all---their enduring love for each other.